What is it about certain locations that causes certain strangeness to gravitate around them? What quality do they possess that should make them such magnets for tales of the weird and the paranormal? The world is littered with anomalous locations that pull around themselves tales of the paranormal like a shroud, concealing them in an impenetrable cloak of mysteries and odd tales. One such place lies in the U.S. state of Ohio, and has for many years accrued a reputation as a very spooky and haunted domain of high strangeness. Out in the wilds of Summit County, Ohio, in the United States, is a place that was once known as Boston Mills. Wandering around this place in recent years all one could see were derelict buildings, weed-choked lots, and crumbling roads that lead to nowhere, an unkept, feral landscape full of the remnants of what once was and inhabited only by the ghosts of the past. Go back a few centuries and it was altogether something different. Once a French trading post in the 17th century, the town itself was founded in 1806, and was a rather pleasant place to be, going on to become a thriving community, for while. In 1974, the U.S. government began a fierce campaign in the region to acquire all of the land in order to establish a park with the National Park Service. The park was to be called the Cuyahoga Valley National Park, and the government began buying up property, claiming eminent domain, and more or less kicking people out left and right. Under the onslaught of the land hungry and very determined National Park Service no one would remain, sending disgruntled private land owners scattering off to other locations to leave their beloved village an abandoned husk, the boarded up houses like fossils from some other time. And this was how it would remain for decades, a mere shell of its former self. The park never came to fruition, abandoned by the Park Service just as the homes and buildings here were left abandoned by the town folk, and Boston Mills became a forgotten place left to be reclaimed by nature. Lurking out there in the trees and with its spooky empty buildings and desolate landscape, it is perhaps not surprising that such a place should draw to it creepy stories, but the former Boston Mills would truly become a wellspring for tales of the bizarre and sinister in the years following its closure, to the point where it would eventually earn its new unofficial name, Helltown. It is hard to tell exactly where to begin with the odyssey of strangeness at Helltown, Ohio. Not long after its abandonment it was said to have become the haunt of mysterious cultists and Satanists, who moved in to perform sacrifices and to leave their arcane graffiti all over the place. Indeed there were often reports of the carcasses of animals being found here that showed evidence of being ritualistically slaughtered. Adding to this macabre reputation as a place of sinister cultists going about their grim work are the rumors of human bodies that have been found out in the woods here in various states of dismemberment. A lot of this supposedly gravitated towards the old shell of the former church, which was said to have upside down crosses scrawled across it and is often seen to have a strange red light flickering within it. There have also been numerous claims that black masses were held at the old church, and there are persitent stories of a strange hermit who lives in the basement who will chase away trespassers. There is an abandoned house in the woods there, and for years an abandoned school bus sat next to this house. The story of how the bus got back there still gives me chills every time I think of it. The bus was carrying a group of high school students who were going to one of the ski resorts near Boston. An elderly woman flagged down the bus and, in a panic, explained that there was a young boy in her house who was seriously hurt. The bus driver, attemping to help, turned down her driveway and drove into the woods, hoping to revive the boy. When the bus approached the house, Satan worshippers swarmed it and sacrificially murdered all of those aboard. The bus sat back there for over thirty years, standing as a warning to all who decided to venture into Helltown. I saw this bus many times before they removed it, and if was very real and very frightening. It is not coincidence that numerous bodies have been found dumped in the woods of Helltown. This place is truly evil, as I have seen with my own eyes. 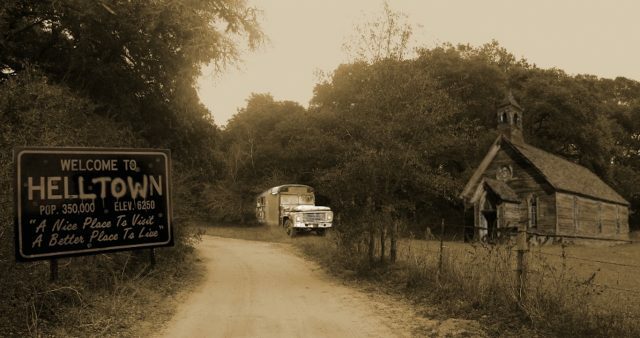 The vicinity of this bus was said to be plagued by all manner of strange phenomena, like the voices of children screaming or crying, and apparitions seen of child-sized figures prowling about in the brush, or even spookier the wraith of a man holding a cigarette, said to be the spirit of the murderer himself. This rusted out hulk sat out there for decades accruing these stories and hordes of curiosity seekers looking to see the “cursed bus,” but as of the present it has apparently since been removed. Adding to tales of murder and mayhem in the area is the old abandoned slaughterhouse said to have once existed here. The lore has it that this place was once used by a psychopathic killer who butchered his victims, and it is said that if one were to look into the windows they would see the tormented souls of the victims. In later years it has been claimed that this slaughterhouse never even existed at all, but it is a potent enough image to make it easy enough to see how it would become part of the whole, larger than life lore of this place. Another very prevalent story orbiting Helltown is that it was once the site of a chemical spill called the the Krejci Dump spill. It was apparently caused by a crashed truck carrying toxic materials in the 1980s, and which was allegedly investigated and cleaned up by the Environmental Protection Agency. According to the tales, the spill has had a lasting impact, causing mutations in animal life, and even humans, throughout the area, which went on to be known as “Mutant Town.” The most notable of these is what is purportedly called the “Peninsula Python,” which is said to be a type of outsized snake said to roam the area to this day. Unfortunately, there is little evidence that any such chemical spill actually ever happened, but it is spooky to be sure. There are numerous other legends about this mysterious place. Supposedly there is an abandoned house out in the woods that always has a light on in its window and is intensely haunted, by some accounts inhabited by an actual witch. Drive along one of the roads past the signs warning you away and you will apparently be trailed by a ghostly black hearse that in some accounts has only one headlight. Speaking of roads, there is another called Stanford Road, or more ominously “The End of the World,” that is said to be cursed, with an unseen force taking over your vehicle should you try to ride down it, and if you do make it to the end it is said you will be greeted by a robed group of Satanists waiting for you. Another road charmingly called “The Highway to Hell” supposedly has a demented, axe-wielding maniac that prowls its expanse looking for new victims, jumping out of the shadows to viciously kill the unwary. There is also a haunted tunnel here supposedly patrolled by the apparition of a long dead man who died in an accident here. The cemetery of the town is of course also said to be a hotbed of activity. The graves are said to be prowled by shadowy figures and even the trees are said to move by themselves. One apparition in particular is said to sit upon a bench here and merely stare vacantly at his domain. There are also numerous reports of strange dancing lights moving about in the darkness here. Not far away is what has come to be known as “Crybaby Bridge,” which crosses the Cuyahoga river and where a baby was according to legend thrown off to its death. If you stop your car there will purportedly be a layer of dust that forms with tiny footprints etched within it. Haunted forests and houses, secret tunnels winding under it all, you name it, Helltown has it. Thus are some of the many, many legends that have sprung up around this very odd and spooky place, but for many they are just that- legends. One very skeptical article by none other than ghost hunters sums it up nicely, with an article by James Willis on the site Ghosts of Ohio, which goes point for point shedding light on the origins for some of these tales. Yet, the stories go on, undeterred, and Helltown, Ohio has gone on to be a treasure trove of strange tales and ghostly sightings. Unfortunately, in recent times it has all mostly been demolished or rennovated in the wake of the renewed efforts to build up the Cuyahoga Valley National Recreation Area starting from the year 2000, and the area has lost that creepy, gritty luster that once made it so remote and mysterious, wiping away most of what made these sinister legends so popular. Go there now, and there is very little to see, the past buried along with its ghosts. Although the are is now crisscrossed by hikers and outdoor enthusiasts, there still seems to be a special allure to this spot, and it still holds about it many incredibly spooky and surreal tales. Perhaps it is all fabrication and the grip of urban legends that latched onto this once desolate and abandoned place. Perhaps it is all just crazy stories of the weird born out of our innate sense of unease when dealing with such places. Yet, whatever the case may be, the legends and stories of Helltown, Ohio, have managed to seep into the realm of the paranormal, and remain talked and discussed about to this day.